Cindy Munsen brings over 30 years of Engineering Design experience to our studio. Eleven of those years Cindy was the owner of Munsen Design and Drafting. Although her background is straight lines and rulers, her expertise utilizing Computer Aided Drafting brings another type of Graphic perspective to the art studio. Cindy is a key contributor to the Wood Décor program. She is involved in many of the wood décor designs and many custom build pieces. Cindy also provides behind the scenes support, including studio space design and organization, along with class preparation and assistance. Gordon Munsen brings over 25 years of Engineering Design experience to our studio. His background includes Computer Aided Drafting and electrical field technician. Gordon’s artistic talent evolved during high school, and later, while working in classic car restoration and painting. But volunteer work as a set carpenter at a local community theater re-sparked his artistic interest. He then spent several years as a set designer and builder, artist, and prop fabricator for a local haunted house. Gordon’s role at our studio includes building all of our wood décor pieces. Although carpentry is his main focus at the art studio, he often lends a hand assisting in the classes as well. Kevin Shifley has a B.A. in Visual Arts Education from Indiana University and a Masters in Curriculum and Instruction from Concordia Chicago. He has been teaching at Lakes community high school for the past 4 years. Prior to teaching at Lakes High School he taught grades K-5 for 8 years at District 76 . Kevin has a background in teaching 2D art, 3D art and photography. 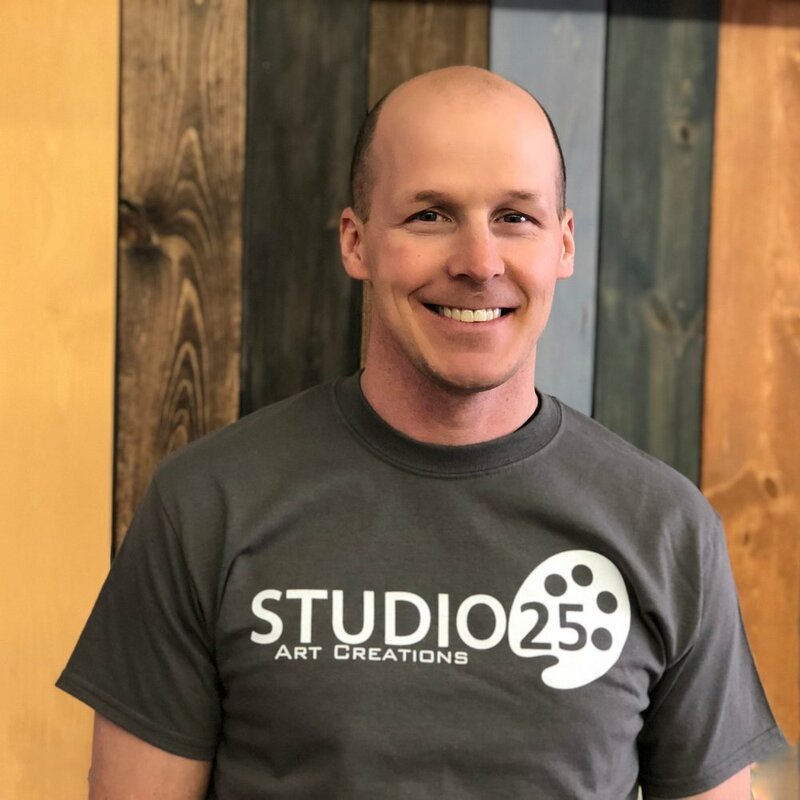 In addition to his teaching, Kevin is the Senior Scholarship Exhibition Coordinator for the Illinois High School Art Exhibition, which is a non for profit organization that helps connect high school seniors with art colleges. Kevin is a practicing artist as well as an educator, regularly submitting his work to various galleries and exhibitions. Kevin is a positive role model for young artists, igniting passion and discovery in every lesson.